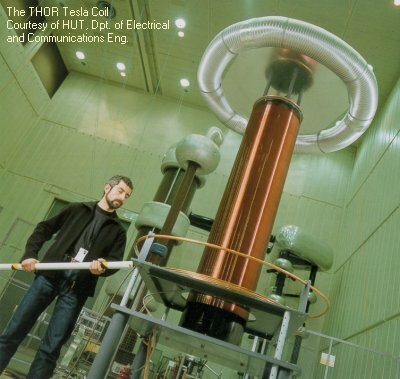 In the beginning of the year 1999, I have started a project at the Helsinki University of Technology, High Voltage Laboratory, which has been eventually named "Thor". This project constitutes the thesis of my postgraduate studies for the degree of Licentiate in Technology. The aim of the project is to design and build a medium-sized Tesla Coil (named Thor too) suitable to perform accurate measurements and research work in general. The task is, therefore, to minimize the number of stochastic and unknown parameters influencing the device functionality. The results of this projects are supposed to facilitate the design and construction of other Tesla Coils to be used for testing of insulating materials, generation of high-voltage pulses, research on natural lightning, and other purposes. Thor is fed by a stabilized DC power supply, which is required to output 20 kV at 5 kW. As the price of commercially available power supplies with these capabilities exceeds easily $30000, this projects includes also the design and practical construction of such a device. For a description of the design criteria that led to the selection of the Tesla transformer topology and size, the power supply topology and the spark gap type, please read the Design Guidelines. January 2000: IGBT driver chip protection resistor added. The chips now survive but the IGBTs will still be damaged during he TC "bangs"
Mid March 2000: the CCPS WORKS PERFECTLY. No damage after several 1-2 minutes runs with my old TC! June 2001: my thesis has been approved. I have got my Licentiate degree! 3) learn about the development, social significance, environmental effects and scientific theory of the areas of science and technology related to his or her own field of research. 2) cover at least one other research area which supports the major subject; this is known as the minor postgraduate subject (10 - 15 credits). Teaching to support the research of the postgraduate student shall be organised, at least partly in the form of lectures and seminars. As an additional minor subject (about 10 credits), a further subject may be selected that complements the major or minor studies. Postgraduate studies may also include other scientific studies (0 - 10 credits).